Two of the most important contributions that Bimal Krishna Matilal made to comparative philosophy are his (1968) doctoral dissertation The Navya-Nyāya Doctrine of Negation: The Semantics and Ontology of Negative Statements in Navya-Nyāya Philosophy and his (1986) classic: Perception: An Essay on Classical Indian Theories of Knowing. In this essay, we aim to carry forward the work of Bimal K. Matilal by showing how ideas in classical Indian philosophy concerning absence and perception are relevant to recent debates in Anglo-analytic philosophy. In particular, we focus on the recent debate in the philosophy of perception centering on the perception of absence. In her Seeing Absence, Anya Farennikova (2013) argues for the thesis that we literally see absences. Her thesis is quite novel within the contexts of the traditions that she engages: analytical philosophy of perception, phenomenology, and cognitive neuroscience. In those traditions there is hardly any exploration of the epistemology of absence. By contrast, this is not the case in classical Indian philosophy where the debate over the ontological and epistemological status of absence (abhāva) is longstanding and quite engaging. In what follows, we engage Farennikova’s arguments, and those of John-Rémy Martin and Jérome Dokic in their (2013) response to her work. Using the work of Matilal (1968, 1986), Bilimoria (2015) and Shaw (2016) we show that there are several engaging ideas that can be taken from Indian philosophy into the terrain explored by Farennikova, and Martin & Dokic. Our aim is to provide an updated comparative engagement on absence and its perception for the purposes of enhancing future discussions within global philosophy. However, we do not aim to do this merely by focusing on the history of primary texts or on twentieth century commentary on primary texts. Instead, we hope to show that the living tradition of Indian philosophy that Matilal embodied carries forward in his students and colleagues as they revive, revise, and extend Indian philosophy. An erratum to this article is available at http://dx.doi.org/10.1007/s11841-016-0551-z. 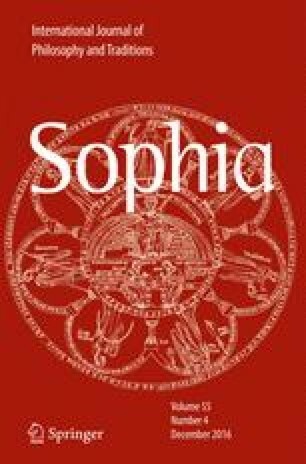 Thompson, E. (2015), “Dreamless sleep, the embodied mind, and consciousness: the relevance of a classical Indian debate to cognitive science,” <http://openmind.net/papers/dreamless-sleep-the-embodied-mind-and-consciousness-therelevance-of-a-classical-indian-debate-to-cognitive-science>.